I am lucky enough to have a variety of garden birds that dine at my tables and feeders, I have even managed to attract chaffinches with some regularity, stunning little birds with a divine song. This made me think about the goldfinch, another member of the finch family. There seem so many similarities between the two breeds, I wonder, do they follow the same diet and are they attracted to the same food? Let’s a take a look. 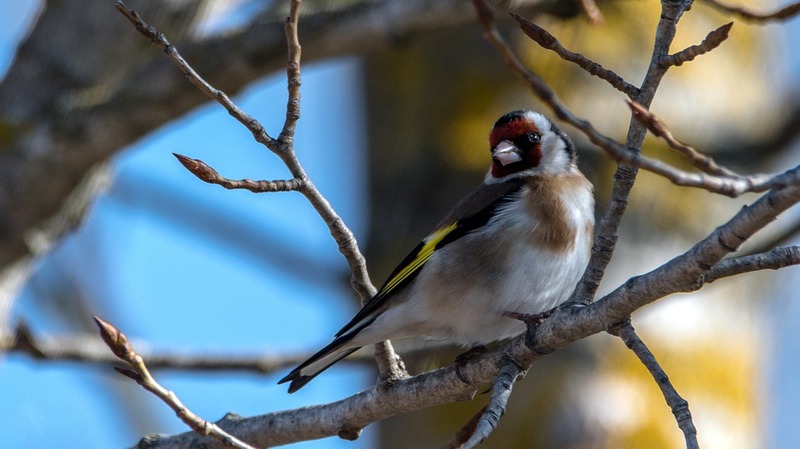 Goldfinches are omnivorous meaning they eat varieties of both plant and animal life. The goldfinch is predominantly vegetarian, though during the spring they forage for small insects on which to feed their young. They eat seeds primarily, using their long beaks to prise them from pods. Lavender and dandelions attract them but thistles and in particular, teasels, are their absolute food heaven. Niger seeds and sunflower hearts in enclosed bird feeders will also entice goldfinches into your garden. The goldfinch is a handsome fella, his face is bright red and he has vivid yellow wing patches, earning him his name. Just like his cousin, the chaffinch, he lives in a loose colony, often with several hundred other goldfinches. They choose their habitat depending on the proximity of feeding grounds. Scattered trees and bushes, rough ground, parks, orchards, heathlands and commons are perfect sites to set up nest. Tall trees offer the shy bird a safe haven from predators on the ground and during spring-time it will be rife with caterpillars and other small insects to eat. During May the five eggs that the female goldfinch laid will begin to hatch and the nestlings will need nourishment. Their diet consists mostly of regurgitated seeds from such plants as dandelion and groundsel. Both parents also gather small invertebrates, such as gnats and flies to feed the nestlings. This is the only food they will have until they are old enough to forage for their own, usually by five to six weeks. If you’re reading this to discover how to attract goldfinches and haven’t yet discovered teasels, then get planting! The tall brown and prickly plant attracts copious amounts bugs during the autumn and winter months. 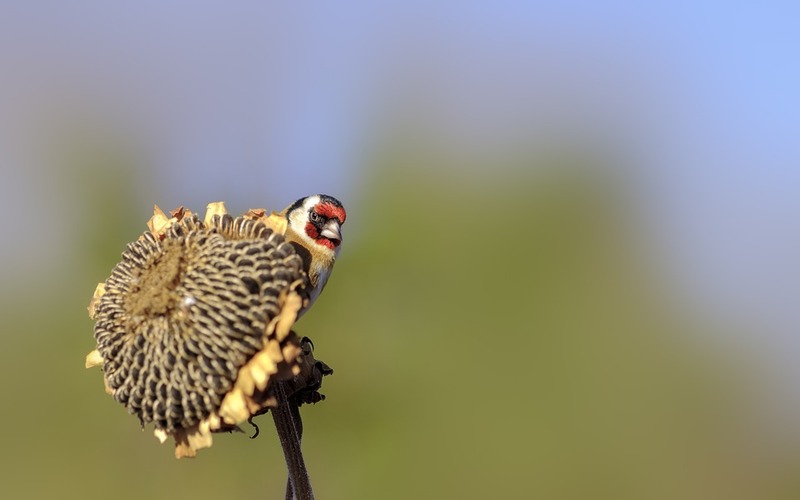 The seed heads dry out and the goldfinch’s beak is ideally suited for using like tweezers and plucking tiny seeds out from between the spikes. In the summer months the teasels will flower, beautiful purple heads which attract many insects, bees, butterflies and moths to name a few. 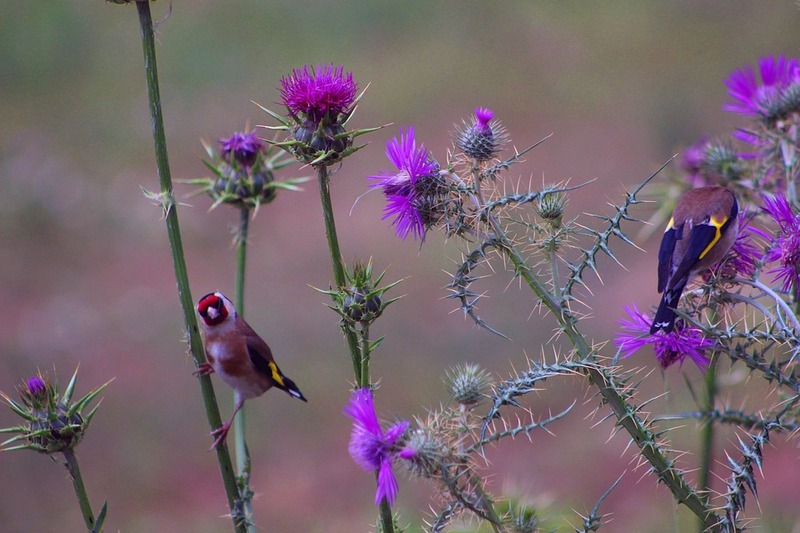 Thistles are also a great source of food for him, his perfectly evolved beak makes him a specialist at safely extricating the seeds from the pods. Goldfinches are sometimes referred to as the ‘Thistle Feeders’ for this very reason. Dandelions and groundsel both have seeds that attract him. What we might consider weeds are a valuable source of nutrition for a goldfinch. Tiny black seeds, that when hung in a designated feeder, are irresistible to the goldfinch. They are rich in oil and high in nutritional value, perfect for winter as the extra calorie hit enables them to store fat and keep warm during the cold months. The high calcium levels also help to keep their bones and beaks strong. Make certain that the mesh squares of the feeder are very small as this will deter any bigger birds and be simple for the goldfinch’s long, sharp beak to manage. The soft white innards of a sunflower seed are full of good fats, vitamins and proteins and are of fantastic nutritional value yet small and easy to carry. I buy the seeds with their hard, black outer shell removed as this makes them more appealing to the goldfinch, as they are easily digestible for their young too. What a thrilling sight, a goldfinch acrobatically hanging upside down at a feeder, reaching all the places other birds simply cannot reach! Ensure you change both seeds regularly as they get damp it becomes a haven for bacteria, which could make the bird ill. The goldfinch may eat a little from suet blocks, particularly when they have a crushed peanut flavouring. 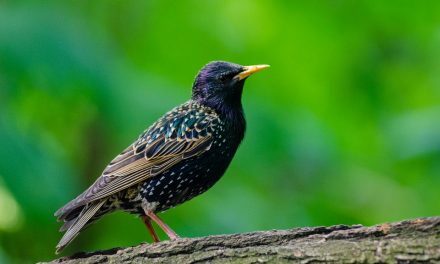 Pre-soaked mealworms are an occasional option for them, though many gardeners say that the starlings clear the bird tables of them before the poor goldfinch has the opportunity to get anywhere near! A flock of goldfinches is called a charm, I think these clever, stunning and tuneful garden birds have charmed me, I hope you have been too. 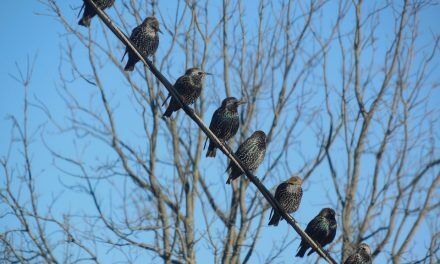 Do Starlings Mate for Life?